The Euroepan groundwater-inhabiting Stygohydracarus subterraneus, from here. Arachnids might not normally be thought of as aquatic animals, but there are a number of arachnid lineages that have taken up a wetter way of life. Among these, it should come as no surprise that a number of them can be found among the mites, because mites are everywhere*. The Athienemanniidae, the subject of today's post, are a family in one of the most diverse lineages of aquatic mites, the Hydrachnidia. *Including on you. Right now. Hydrachnidians are themselves one of the major subgroups of the mite lineage known as the Parasitengonina (briefly referred to in this post). The larval stage of the Parasitengonina, as the name of the group suggests, are parasitic on other animals, while the second nymphal and adult instars are free-living predators. Between each of these stages (i.e. at the first and third nymphal instars) is a non-feeding instar that could be thought of as a 'pupal' stage. As with an insect's pupal stage, parasitengoninans go through a significant physical transformation between stages (and I'm not just talking about the addition of an extra pair of legs between larva and nymph—all mites do that). Mature hydrachnidians are often heavily sclerotised, but larval hydrachnidians (like female ticks) are soft and membranous around the sides so they can swell up full of their host's internal juices. 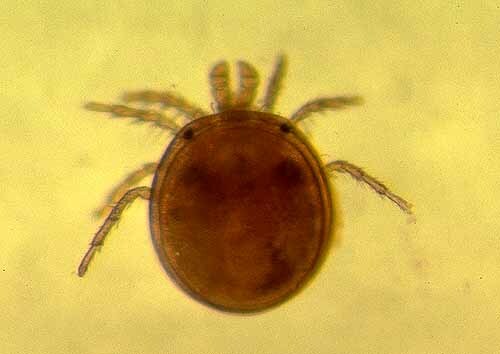 A North American spring mite, Chelomideopsis besselingi, photographed by I. M. Smith. 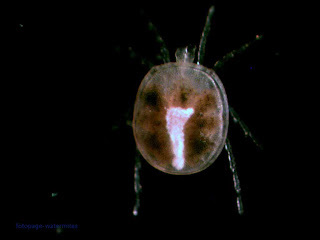 The Athienemanniidae are one of the smaller mite families, with only fourteen currently recognised genera (Walter et al. 2009). Distinctive features of the family include a dorsoventrally flattened capitulum (the 'head-like' region of the animal incorporating the chelicerae and the pedipalps) and a rotated pedipalp, with the tarsus (the terminal segment) not visible from the side. The lifestyle of most athienemanniids remain little studied, but where known the larvae are parasites of midge larvae (for reasons about to become clear, this is probably not the case for all species). A number of species of Athienemanniidae are found in streams and springs, but the family is also diverse in the hyporheic zone, the region of sediment beneath and alongside streams where the water contained in the stream mixes with the groundwater. With their flattened, armoured bodies, athienemanniids would be well suited for crawling among the pockets of water between sand and gravel grains. There are also a number of species that have become adapted to live in the groundwater itself and may be found deep below the surface. Despite the relatively small number of recognised species, the Athienemanniidae have been divided between four subfamilies. The great majority of species belong to the Athienemanniinae, which is also the most widespread subfamily. Species of Athienemanniinae are known from surface to ground waters in Eurasia, Africa and North America, and a single species Anamundamella zelandica is known from groundwater in New Zealand. The other subfamilies all contain small numbers of species in more restricted areas. The genera Stygameracarus and Africasia are each placed in their own subfamily; Stygameracarus is found in hyporheic gravels in North America, and Africasia in streams in southeastern Eurasia and tropical Africa (Walter et al. 2009). The subfamily Notomundamellinae contains four genera found in hyporheic gravels in Australia (Smit 2007). The world diversity of Athienemanniidae is undoubtedly underestimated, perhaps significantly so. Sampling hyporheic and groundwater habitats can be a difficult process, and species found in these habitats generally exist at very low population densities. Even sampling previously productive localities may not be guaranteed to yield a result (Smit  named one of the Australian athienemanniid species Janszoonia difficilis because of the difficulty in collecting the type specimen). And even if you do find them, you still have to wonder what it is that they're finding to eat down there. Smit, H. 2007. New records of hyporheic water mites from Australia, with a description of two new genera and ten new species (Acari: Hydrachnidia). Records of the Australian Museum 59: 97-116. Walter, D. E., E. E. Lindquist, I. M. Smith, D. R. Cook & G. W. Krantz. 2009. Order Trombidiformes. In: Krantz, G. W., & D. E. Walter (eds) A Manual of Acarology, 3rd ed., pp. 233-420. Texas Tech University Press. Water mites can be a great deal of fun to collect: many of the species are abundant in various freshwater habitats and there seems to be no end to the scarcer species. A personal favorite factoid is that a number of species are obligate parasites of freshwater clams: if you are concerned that clams are going extinct, you get a twofer with the mites. One of the big problems with the Parasitengona is associating the adults with the larvae. Often they have been collected and named separately. Water mites may suffer from taxonomic inflation: what might be a genus in another group could be a superfamily in water mites. At least that was my impression 35 years ago: I don't know if it's really justified. There were similar issues with Oribatid mites. Well, there's no such thing as a definition of a family vs a genus anyway, and blah blah blah. But yeah, water mite and oribatid workers do seem to like their tightly defined families.